Whitney Houston, Beyoncé, Mariah Carey, and Lady Gaga have all officially sung the National Anthem at the Super Bowl. 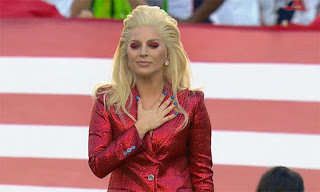 Lady Gaga is such a betty, I love her, last night the Denver Broncos won the annual Super Bowl game against the Carolina Panthers, where Gaga sung the anthem during the NFL opening ceremony at the Levi’s Stadium in Santa Clara, California. Lady Gaga killed it in a shimmering red Gucci suit, blue mani, red eye shadow, and stomping red, white, and blue Gucci platform shoes. Better work! 'It’s such an honor and a dream come true, I’ve always wanted to sing the National Anthem at a major sporting event since I was a little girl, and for it to be the Super Bowl, it is the ultimate..' she revealed to NFL Network.